In Spain people live to eat not eat to live! So we guess that you should know the traditions of local people about food and drink in Barcelona city. One of the best Spanish dishes is Tapas. Actually this is not a main course but it is name given for a collection of small dishes which consists of many different food kinds such as slices of bread or meat, a bowl of almonds, meatballs with sauce or skewer with pickles. So in this article we are going to mention about what is tapas, what is there in tapas, which tapas restaurants are the best, the history of tapas and how to order tapas? Tapas is a general name for a collection of wide variety of small dishes such as appetizers or snacks served on a plate in Spanish cuisine. 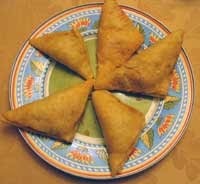 So Tapas is a name and it consists of different food types served warm or cold. It is chosen for an entire meal but sometimes tapas lovers can order a few different plates of tapas to make a main course. 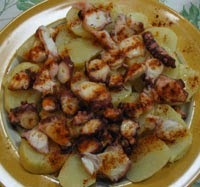 In Central American Cultures ''bocas'' is used instead of tapas and in Mexico ''botanas'' is also used to indicate small dishes collection as tapas. Tapas idea has arisen from the history of Spain itself with the help of incorporating of other cultures throughout history. Meeting olive after Spanish came across with Romans, invasion of North Americans brought almonds, citrus fruits and spices have tried to form a type of dishes in Spanish cuisine. When are Tapas plate served best? In our earlier articles we had mentioned that people in Barcelona and all Spanish give a really big importance on dinner. They generally eat dinner between 9 and 11 pm. and for lunch people in Barcelona prefer time between 2 and 4 pm. So if you try different tapas types you can choose noon and the time before dinner is served. Of course this suggestion is for travelers whom like to act as local people:) . You can try tapas any time you want but you should know that in Barcelona, tapas is preferred for appetizer. That's why it's called mini-menu. For a tourist there is no exact time to try new things. So feel free while giving order tapas that you choose. Non vegetarian tapas names are ham croquettes, mondaditos de Berenjena (eggplant, chicken & peppers), empanadillas gallegas, ham, cheese and chorizo with bread and pulpo gallego ( galician style octopus). Generally tapas dishes are flavored with garlic, paprika, chilies, salt, saffron and olive oil. 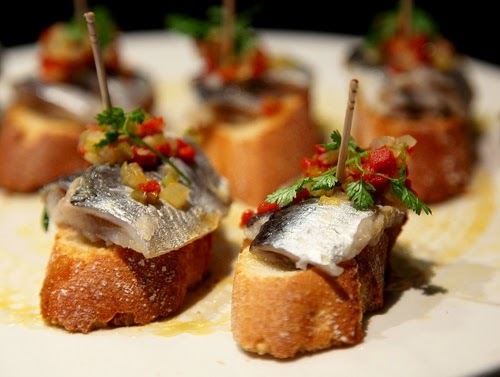 Seafood tapas are generally consist of squid, anchovies, mackerel, sardines in a tomato based sauce. In Barcelona city, it's easy to find all kinds of tapas at bars. 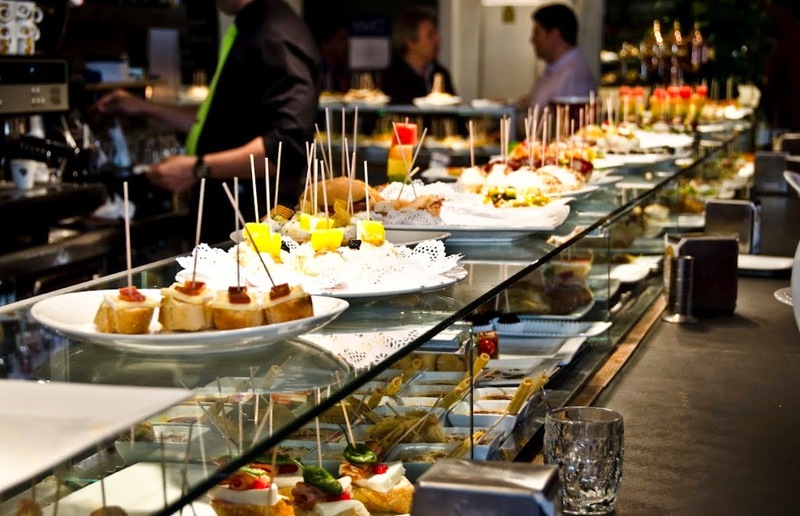 If you will taste tapas for the first time we suggest you select a good tapas bar in Barcelona city. When you plan a Barcelona city travel, it's good to know earlier best tapas restaurants if you like to try new tastes. Quimet i Quimet Restaurant which is open from Monday to Friday between noon and 4pm, 7pm and 10.30pm. On Saturdays and holidays it is open from noon to 4pm. The restaurant is in the centre. 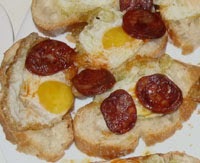 The dishes are generally canned food but montaditos which is sculpted tapas served on bread is great. Apart from this you can try salmon sashimi with cream cheese, honey and soy or cod, passata, and black olive paté. Please prepared to its hectic atmosphere so try to arrive earlier. Generally tapas bars serve you standing which enables you make conversation with people easier. You can access there by using Metro L2 or L3. El Jabali tapas restaurant can be a good choice if you want to try best tapas in Barcelona city. It serves best patatas bravas, chicken salad and cured sausage. There is a terrace on top if you would like to sit and have a look around. It is open every day but monday from 9am to 2.30 am. You can access there by using Metro L2 or L3. La Taverna Del Clinic tapas restaurant is a very unique local restaurant. If you like hanging around like local, this restaurant may be a good choice. You can try creamy morels with foie, a sticky oxtail stew made with Priorat wine or a tiny skillet of chips, fried agg and crispy jamon. The octopus igloo is really worth to taste. The restaurant is open between Monday and Friday from 7.30 am to 11.30 pm. On Saturdays it's open from 1.00 pm to 11.30pm. You can access there by using metro L5. 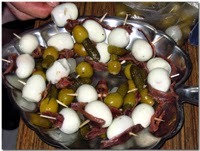 Above tapas are general ones and there are other types of tapas. As you see, it's not a specific plate so it can consists of many different type of food. So it can be a good idea try any kind of tapas in Barcelona city to try a local taste on your Barcelona city travel. At restaurants it's easy to see different names for tapas. Here below there are general tapas names that you may come across. 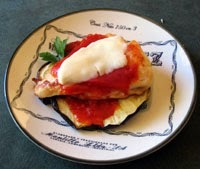 Raciones: You will come across a price for raciones and tapas separately. It is the same dishes but racione word is used for bigger portion. This is the only difference. So if you are hungry you can select raciones. 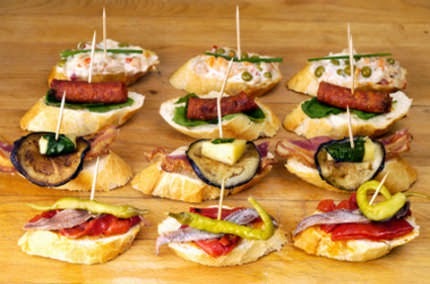 Pinchos: This kind of tapas is used for dishes served on slice of bread and as we mentioned above in Quimet i Quimet restaurant you can see many samples of pinchos. In Barcelona city, tapas are mostly served in crowded bars and people usually stand but of course there are tables to sit. Firstly you should tell the waiter that you are going to eat while drinking something. Another tip to order tapas is as the restaurant will be crowded make sure the person taking order see you. If you don't know the exact quantity for your tapas you can ask the waiter about the right portion of tapas you order. They will help you about that. Some tapas are served hot so when you order they will heat your tapas for a while and after that you can grab your tapas but don't worry that they will take your attention when your tapas is ready. When you plan a travel to Barcelona city, it's important to know what you eat or drink. As we don't want you regret about your vacation in Barcelona city, we try to inform you about local and Catalan cuisine so that your holiday can be perfect. We hope we can be your best Barcelona city travel guide.